The latest release of ‘smart socks’ means the internet of socks has officially arrived. These socks can communicate via Bluetooth with other devices, such as clothes drawers and washing machines. This exciting new technology means lost socks are a thing of the past! Never again will a pair of socks be separated, as the socks can alert the user of their location. Imagine the scenario: one sock is located in a drawer, while the other sock remains in a washing basket, washing machine, or even worse: in the garden. Most people will recall those situations where one lone sock remains after finishing a wash, and the other sock in the pair is nowhere to be found. Well, never again. The new socks will retail at around £25 ($18) per pair, but i-SoX, the smart socks manufacturer, based in Ireland, has indicated that prices will eventually drop, as their factory produces the socks in larger quantities. However, what will internet connected socks do for privacy? This remains a serious question, because a user’s location could be tracked by using the location of the socks. Some security experts suggest that wearing two different socks, by splitting an original pair, could fool the tracking software – essentially by being in two locations at the same time. 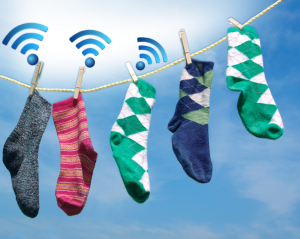 Early results from a survey about ‘Internet Privacy and the Internet of Things’ show that consumers do not wish to be tracked by online tracking devices, so it is not clear how big the potential market will be for connected socks.